There’s truly nothing better than having a swimming pool to call your own. It offers the perfect resource to cool off on a hot day, while allowing the kids to have some fun in the sun. But you can also turn your swimming pool into a real entertainment area by adding a pool bar! Imagine swimming up to a bar and grabbing your favorite cocktail without having to leave the comfort of the water! No longer do you have to be at a resort down south in order to enjoy a swim-up bar – you can have your very own! Of course, you can always install a traditional bar that’s located nearby the pool. Either way you go, a pool bar can significantly boost the fun factor of your backyard. Pool bars can easily be the hub of backyard entertainment, aside from the swimming pool itself. There are all sorts of features and amenities that you can add to your pool bar to make it as comfortable and convenient as possible. For instance, you might want to consider adding a ceiling with some track lighting to create some shade from the hot sun. You can also add a sink, storage for glasses, and beverage chillers to create the full bar experience. You can choose specific features that create a certain theme that you might be going for. For instance, choose amenities and elements that can create a beach oasis by adding a tiki bar roof. Or, create a 5-star hotel theme by making use of marble counters and mosaic tiles. The choices are seemingly endless when it comes to how you want to build your pool bar and the exact vibe you want it to give off. 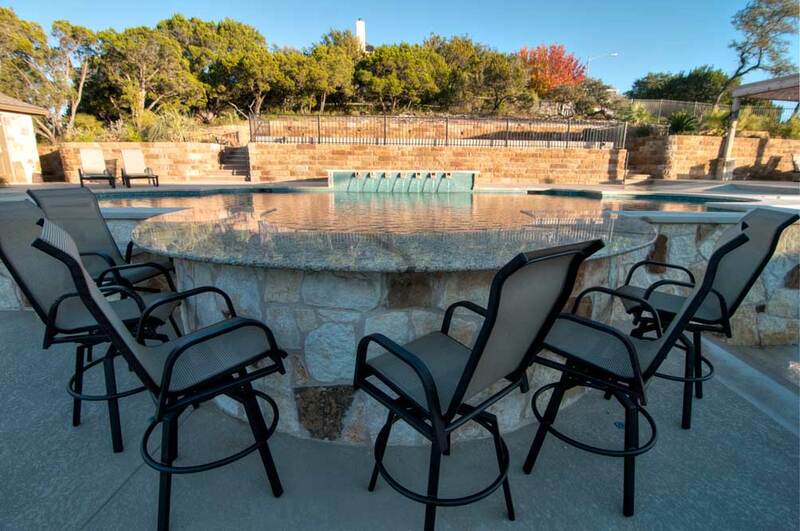 To have a pool bar installed in your pool, be sure to have experienced and professional Austin Texas pool builders come in and design and create the perfect bar to complete your backyard!